Maputo — Mozambican President Filipe Nyusi on Monday declared that the demilitarisation of the country's main opposition party, the rebel movement Renamo, is a condition "sine qua non" for a democratic, stable and peaceful Mozambique. Speaking on the occasion of the 43rd anniversary of Mozambican independence from Portuguese colonial rule, after he had laid a wreath at Maputo's Monument to the Mozambican Heroes, Nyusi said there is "no alternative" to the demobilisation and disarming of the Renamo militia, and integrating its members, either into the defence and security forces, or back into civilian life. Preparations for the municipal elections scheduled for 10 October have stumbled over the question of demilitarising Renamo. An extraordinary sitting of the Mozambican parliament, the Assembly of the Republic, was scheduled for Thursday and Friday last week, with the specific purpose of changing the legislation on municipal elections to bring it into line with the constitutional amendments passed in May. But on Wednesday, less than 24 hours before the sitting was due to start, the parliamentary group of the ruling Frelimo Party insisted that, without some movement on Renamo demilitarisation, the sitting could not take place. The head of the Frelimo group, Margarida Talapa, insisted that concluding the decentralization process (by amending the municipal legislation) cannot happen as long as Renamo is failing to honour its undertaking to disarm its militia. Nyusi said that, on the government side, all is ready to secure the demilitarization of Renamo in time for the October elections. He repeated his commitment to continue the dialogue with Renamo that he had begun with its late leader, Afonso Dhlakama. He said that at his last contact with Dhlakama, before the latter's unexpected death on 3 May, the two leaders had drawn up lines of action and a calendar for demilitarization. "This consensus was witnessed by military officers of both sides and representatives of the international contact group", Nyusi revealed. A synthesis of the consensus was drawn up, he added (although it has not been published). He added that the government did not want to add "new elements" to what he had negotiated with Dhlakama. Such "new elements" (which he did not specify) "can be considered as details on which decisions can be taken by the high command of the Mozambican Armed Forces (FADM)". Nyusi wanted the demilitarization to begin immediately. He was working towards this "and I have no doubt that, with the good will of all, we shall be successful". "We understand that the new leadership of Renamo needs some time to absorb the context of the steps we had previously taken with their late leader, Afonso Dhlakama", he added. But he urged the Renamo leadership to move quickly so that effective and lasting peace can be achieved. "Disarmament, demobilization and reintegration are processes that the armed men in the ranks of Renamo, and above all the Mozambican people, have been waiting for with great expectation", Nyusi stressed. Peace was indispensable for achieving any project "and the collective awareness we have of this is what makes us fight tirelessly so that peace can never be compromised", he said. 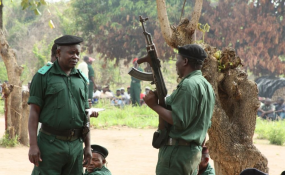 The truce declared by Dhlakama in December 2016 has held, and there have been no clashes between the defence and security forces and Renamo units for the past 18 months. But there is no truce with a shadowy terrorist organization, faithful to Islamic fundamentalism, which is active in parts of the northern province of Cabo Delgado. Nyusi strongly condemned the atrocities committed by this group, which include the burning of villages, and the murder and beheading of civilians. He pledged that the government will not rest until those responsible are brought to justice for their crimes. "We have followed with indignation the acts perpetrated by groups of criminals in some districts of Cabo Delgado, allegedly with religious motives", he said. "These are heinous crimes which disgust all of us". The terrorist raids had plunged the people of the affected areas "into a state of anxiety and tension, and has contributed to their poverty, since they have lost their sources of income", added the President. Nyusi added he is convinced that the government enjoys the support of the rest of society in its attempts to end terrorist attacks. Citizens should "remain calm and collaborate with the authorities by denouncing any and every anomalous situation, in order to frustrate the initiatives of the criminals". "In moments like this, careful consideration is required so as not to take precipitate action, because unfortunately there are those who consider themselves more far-sighted, even when they don't know what they're talking about", he said. "The problem has to be solved in depth". Clearly responding to those who have criticized his government for not speaking much about the situation in Cabo Delgado, Nyusi said "the government is attentive and is looking for productive solutions without painting itself as a victim". If it was not issuing comments or "lamentations", that was because "the government has the responsibility to find strategic solutions". As for the motives of the attackers, Nyusi stressed that the government "believes that any claims from sectors of the population, whether legitimate or not, should be raised in the appropriate places and solved through dialogue". He urged his listeners not to be carried away by emotion "because the aim of the criminals is to demoralize our will to exist as a society, as a nation, and with functioning institutions. We cannot allow anybody, any wandering gangs, whether consisting of Mozambicans or foreigners, to perpetuate the absence of peace". He urged all those who feel they have grievances to cease attacks immediately, and raise their concerns with the appropriate bodies. Nyusi pledged that the government will make every effort to bring the attacks to an end as soon as possible, while respecting human rights.